We each have a book. It was requisite to pannier packing for our trip. We figured there would be long waits, restful nights and opportunities to stretch out in the grass for a good read. Caleb brought the final book of one of his favorite series: The Last Olympian (which he read, and I just sent home) and he also brought a book on Greek History. James brought The Agony & the Ecstasy---one of his all time favorites---a biography of Michelangelo. Anthony chose (okay, we insisted because we knew he would love it and trust me, he did): The Da Vinci Code. James and Anthony already read it, and now it is Caleb's turn. I picked (despite haranguing from James for the space/weight it would consume in my pannier): M.F.K. Fisher's The Art of Eating. 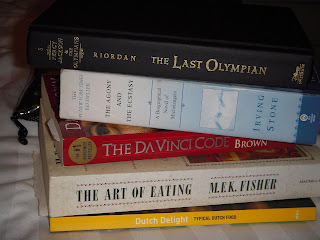 Oh and I added a slender little book from the Van Gogh museum bookstore on Dutch food. Loved it---just sent that home too, to lighten the panniers. In Utrecht we found a small English section of used books in a book store. (We needed to find Anthony a thick book, so he wouldn't blow through it in a few short days). He just finished The Agony and Ecstasy by Irving Stone (same author of Lust for Life, the biographical read on Van Gogh). In the bookstore, we picked up a soft cover of Pillars of the Earth. That should keep him busy for awhile. Anthony: check email, play itouch, paste postcards/write/sketch/update windmill count in journal, read book, blog. Caleb: check email, play itouch, paste postcards/write/sketch/update windmill count in journal, read book, blog. James: check email/facebook, paste postcards/write/sketch in journal, update itinerary/manage insurance/budget/etc., read book, drink wine, blog. Janelle: check email/facebook, upload photos and organize them by city, BLOG on family frolics and talk of tomatoes, research places to stay in Florence, drink wine, read book. One thing is certain: it is easier to fill up down time than it is to carve it out. Although we realize that since we are on 'holiday,' in many ways all of our time is down time. And for that, we are grateful. So... if you had to pick just one book for your summer, what would it be? 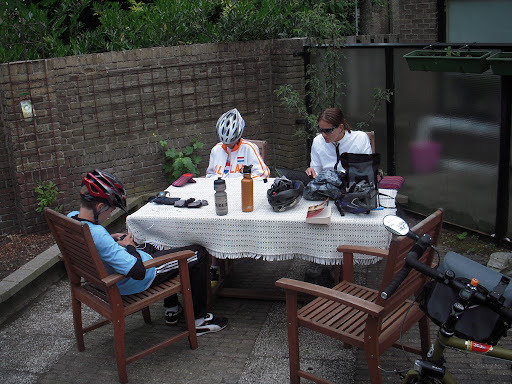 I'm enjoy your blog very much and am having so much fun following you as you cycle the netherlands. I love seeing all those familiar dutch scenes and foods!! Don't you just love those chocolate sprinkles?